The Blinken OSA Archives have established a thematic repository which contains a collection of digitized items provided by the Archives and their cooperative partners. The Repository’s collection of digitized video images includes a 47-minute film found among the discarded reels kept at the Dunakeszi police dog training center of the Hungarian Ministry of the Interior. 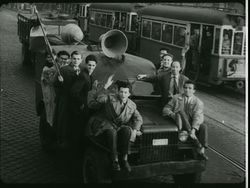 In 1957, the Ministry collected footage of the ’56 Revolution shot by shot, and then the former Film Studio of the Ministry of the Interior (B.M. Filmstúdió) edited it to get a 47-minute documentary. Although some of these shots are not unknown today, they have managed to digitize them in high resolution and in very good quality, unlike the low quality and poorly copied materials seen so far. Breaking with the practice of other organizations, such as MANDA, which copies film footage of 1956 for a price of HUF 30,000 per minute, granting permission for one-time use only, OSA has decided to make the reel, which had been discovered and digitized by them, freely accessible for all . The collection includes nearly a thousand images of the 1956 Revolution, shot by Fortepan; voice recordings, documents and reports by Hungarian Radio and Radio Free Europe (RFE) from 1956; the 1956 news archives of Péter Zwack; the CIA’s materials related to the Revolution; documents prepared by the UN Special Committee dealing with the Hungarian issue; as well as thousands of pages of interviews with Hungarian refugees at Columbia University. The Archives will launch several public projects based on this freely available collection. This is a joint project by Fortepan and the Blinken OSA Archives which uses social media, i.e. Facebook, to investigate the identity of key players in the Revolution with the help of the public. This initiative aims to identify those participants of the 1956 Revolution, children, youngsters, university students and workers, who have been immortalized in the archival photographs and film footage. In the quieter days of the Revolution, the streets were packed with people. Many joined the demonstrators or the armed resistance movement, while others simply wanted to get food or take a look around Budapest, where there was an atmosphere of war. The organizers will publish photographs and film footage which has been slowed down on the project’s Facebook page, hoping that many people will be able to recognize their relatives, acquaintances or even themselves in this footage shot 60 years ago. As part of the series of projects, a student competition will be launched jointly with Prezi . Young people under 20 years of age may enter this competition. They are invited to present the story of the 1956 Revolution to others, their peers and their teachers in an interesting and unique way, using the digital collections of the Archives, with the help of digital technology and smart devices, using innovative visualization solutions and/or by developing special software applications or games. Prizes worth a total of 10 million forints, as well as an internship at Prezi, will be awarded to the winners, whose works will be made available to the public and presented in the exhibition hall of OSA in an award ceremony on October 21, 2016. The jury will comprise leading experts of important technology companies. In cooperation with the History Teachers’ Association of Hungary , a competition has been announced for history teachers entitled ‘Let’s Speak the Truth about ‘56’ ( ‘56-ról hitelesen ). On the sixtieth anniversary of the 1956 Revolution, this project aims to present the era of the Revolution, its aspirations, events, consequences as well as the lessons learned using primary sources of information, original footage, images, voice recordings and written documents, enabling students to understand history and put themselves in the shoes of their predecessors. Two types of entries may be submitted: either scenarios or electronic creations/installations that can be used during commemorative events in schools. Prizes worth a total of 1 million forints will be awarded to the winners of this competition for teachers. After many years of failures, we have succeeded in finding the Vienna archives of the International Rescue Committee , an organization which helped Hungarian refugees in 1956. These records were believed to be lost for decades. The Vienna office registered most of the Hungarian refugees in 1956. The records of the Columbia , Rutgers and Stanford Universities , Bard College , the Eisenhower Library , the US National Archives , the American Hungarian Foundation , and last but not least, the International Rescue Committee (IRC) reveal the history of 1956 from a brand new perspective. In an era when resurgent nationalism seems to overtake historical facts, there is a fundamental need to provide online access to these enormous collections of documents and images for Hungarian researchers, students and teachers. These activities of the Blinken OSA Archives are not without precedent. In 2006, with the support of Donald and Vera Blinken, we organized and digitized the records of Columbia University containing interviews with Hungarian refugees in 1956. In 2006, with the courtesy of Klára Héderváry and the National Széchenyi Library, documents prepared by the UN Special Committee dealing with the Hungarian issue were also made accessible and researchable online. In 2016, again under the auspices of Vera Blinken, and in cooperation with the International Rescue Committee, a multi-year program will be launched with the aim of providing an insight into the transnational history of Hungarian refugees by means of a continuously growing and dynamic digital platform. This series of projects by OSA concerning the Revolution of 1956 will be launched on 17 March 2016, as the first meeting of the ‘Petőfi Circle’, the association that prepared the Revolution in 1956, was held sixty years ago on this very day. The first of this series of debates named ‘ Petőfi Circle 2016 ’ will be held on this day. This series of six debates, organized in collaboration with the Faculty of Social Sciences at ELTE University and the Göncz Árpád Foundation , seeks to discuss, in the full glare of publicity, fundamental issues that determine our political culture, society, success, human dignity as well as our daily lives and in relation to which, unfortunately, there has been no public dialogue so far. On the sixtieth anniversary of the first meeting of the Petőfi Circle in 1956, this series of events, to be held from March 17, 2016 to November 4, 1956, revives and relaunches this public discourse. The guest speakers, debate partners and participants in the public debate will deal with issues that are fundamental for people in a democracy, discussing tangible examples that affect all of us (such as freedom, justice, patriotism, etc.). Each topic will be introduced by well-known scientists, public figures or university students; the invitees also include renowned public figures, artists and students who are actively involved in public debates. A new website will be launched by the organizers in relation to this series of debates. The debates will be held in the main auditorium of the Faculty of Social Sciences at ELTE University. It is planned that the media will report about the debates continuously and in detail. Without the donation of former US Ambassador Donald Blinken and his wife, Vera Blinken , who is of Hungarian descent and was a refugee herself, this series of projects relating to the Revolution of 1956 would not have been possible.